Well, over the past month or so, I’ve noticed a trend where sub-groups are forming and are very interactive with one another. And these groups don’t have A-Listers. If FriendFeed is to grow, it will have to get beyond being dominated by A-Listers with their large number of subscribers. But now look. Today, he tends to track more closely with everyday folks on FriendFeed. One person in that blue pie chart, Kyle Lacy, has even started a Facebook group for his friends: The FriendFeed Night Crew (click here to see the group logo on FriendFeed). This is just one sub-group of which I’m aware. I’m sure there are others. 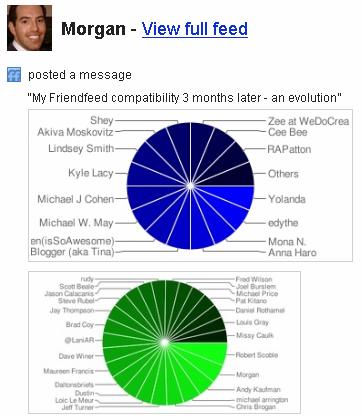 Consider this a small marker of FriendFeed’s progress out of the A-List garage. Aren’t we all part of the alist group now? 🙂 Thanks for mention Hutch! Hey Hutch – thanks for picking this up and extending it! I think it’s a very exciting and as you say healthy progression for the site. I’m much happier with the “Blue” chart – it represents real interactions and relationships rather than simple fanboyism (i just made that up). I agree with you – an important progression/evolution and a great post on the idea. Definitely nothing against the A-list folks, but FriendFeed is eons more exciting, fun and interesting when the FF Night Crew is in full effect.